I’ve decided that I’m going to start this blog Kathleen Kelly style and jump right into it. So, without further ado, I give you Peanut Butter Chocolate Chunk Cookies! 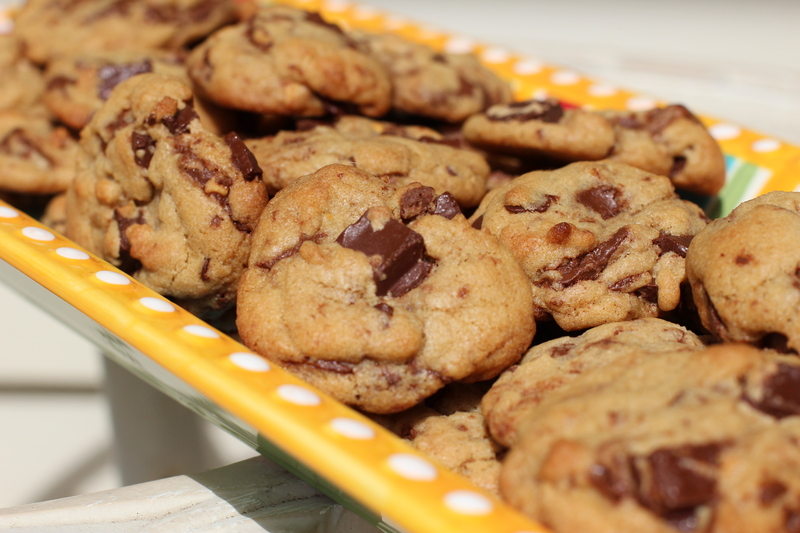 To melt the chocolate chips, microwave them in a microwave-safe bowl for thirty seconds. Stir, and then microwave for another thirty seconds and stir again. Mix the peanut butter into the melted chocolate and then spread the mixture in a thin layer on a parchment paper-covered cookie sheet (or any large tray). Pop the tray into the freezer until the chocolate is hardened. Once the chocolate is hardened, roughly chop it into about ½ inch pieces. If the chocolate starts melting while you are chopping it, don’t worry. It will harden up again in the freezer. If it is melting to the point where it’s too squishy to chop, it probably needs more time in the freezer. Wait a little while and then try chopping it again. 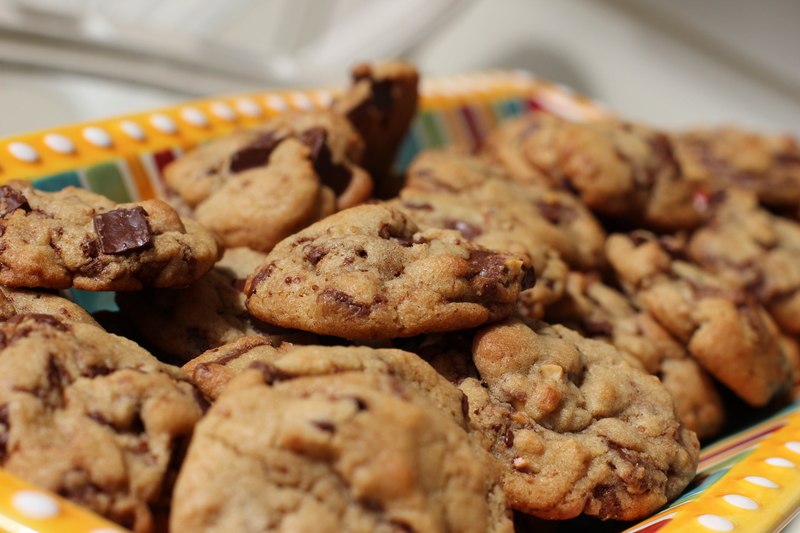 (The first time I made these cookies, the humidity was pretty high and the chocolate took a really long time to harden.) Pop the chopped chocolate back into the freezer until ready to use. Preheat the oven to 350˚ Fahrenheit and line cookie sheets with parchment paper. Because my oven runs a little high, I usually turn the oven knob in between 325˚ and 350˚. Melt the butter and then let it stand at room temperature until it solidifies, about an hour, stirring occasionally to make sure all of the butter sets. I melted the butter in the microwave and then transferred it to a large, shallow bowl to help it cool faster. I know that melting butter just to let it re-harden sounds silly, but it really gives the cookies a nice texture. In the bowl of a stand mixer, cream the butter and sugars on medium-high speed until the mixture is light and fluffy, about one minute. Add the vanilla, egg, and egg yolk to the bowl and continue to mix until incorporated. In a medium bowl, whisk the flour, baking soda, and salt together. With the mixer on low, add the flour mixture in three additions, mixing until just combined. Scrape down the bowl as needed. I personally find that with my mixer, the bowl is too narrow to add the flour while the mixer is running because some of it spills on the counter while the rest poofs up in a white cloud before settling on the floor. I will stop the mixer and take the bowl out to add each addition. When I pull the bowl out for the second addition, I usually scrape the sides of the bowl down, too. That’s just what works for me, though. With the mixer running on medium-low, add the chocolate chunks and peanut butter chocolate chunks and mix until just incorporated. If your mixer starts making churning noises, either bump up the speed or stop and mix by hand. Okay, right now you have a couple of options. Cookies in general will bake up prettier (they’ll spread less) if the dough is refrigerated before baking. I am impatient when it comes to baking cookies—the sooner they’re baked, the sooner I get to eat them, right?—but I do think refrigerating the dough at least a little bit is a good idea. I will admit that I didn’t refrigerate the dough for two or three hours like I probably should have (Like I could wait that long for freshly baked cookies! ), but I did cover the mixer bowl with plastic wrap and pop it in the fridge while I cleaned up my baking mess. Then, when I was done cleaning, I got my first cookie tray ready and put it in the oven. While that baked, I got all of my other trays ready. As I finished each one, I popped it in the fridge to get extra chilling time in while it was waiting its turn in the oven. So, you can either do that, be patient and let the dough chill the proper amount of time, or just bake them up right away and have delicious and hot cookies while I’m still trying to make room in my refrigerator for three cookie trays. The choice is up to you! Back to the recipe, though! Using a tablespoon, scoop up dough and plop it onto the tray. I like doing three cookies across and four down on my 9×13 in. cookie trays. You can make the cookies smaller or larger depending on how many you want. I usually am making cookies for a crowd and tend to make the cookies on the smaller size, but it really is up to you. If you make them pretty large, though, I suggest doing fewer than three across and four down because your cookies might run together and make one big cookie! Actually, a giant cookie sounds pretty good. Maybe you should do that! Bake the cookies for eight to ten minutes, rotating the sheets halfway through, or until the cookies are a light golden brown. I like baking cookies one sheet at a time because I find that they bake more evenly. If you do bake two sheets at a time, watch them carefully, rotating and switching the trays halfway through baking. Cool the cookies on a wire cooling rack. Once the cookies are just warm to the touch, I like to transfer them to a paper grocery bag I cut open and spread on the table. This opens up my cookie sheets in case I still have dough to bake and also frees up my cooling racks. It also helps the cookies cool a little faster since they’re not soaking up the heat of the hot cookie tray. Enjoy the cookies with a glass of milk! Posted on July 1, 2013 by rjoy19	• This entry was posted in Chocolate, Cookies and tagged Chocolate, Cookies, First Post, Peanut Butter, Yummy. Bookmark the permalink.